Dr. Hexagon has been volunteering for Moisture Festival for at least a decade. He’s not sure of the first year… but his first gig was posing as roadie for the illustrious Baby Gramps. By Gramps prodding – er encouragement – Dr. Hex showed up dressed in working coveralls toting one of his guitars, started moving chairs, picking up litter, and generally helping out. He was immediately captivated by the creative and community vibes and henceforth has been on the security crew every year. Sporting duds in high festival style (one could definitely consider ceremonial festival gear), entertaining many a Fester asking “are you the MC?” and inspired by the likes of Armitage Shanks, this long-time dream debut’s at the 2019 event. 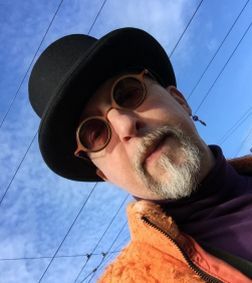 Off stage Dr. Hexagon is known as Sage K. Saskill – Architect & Wize Guy for the people.